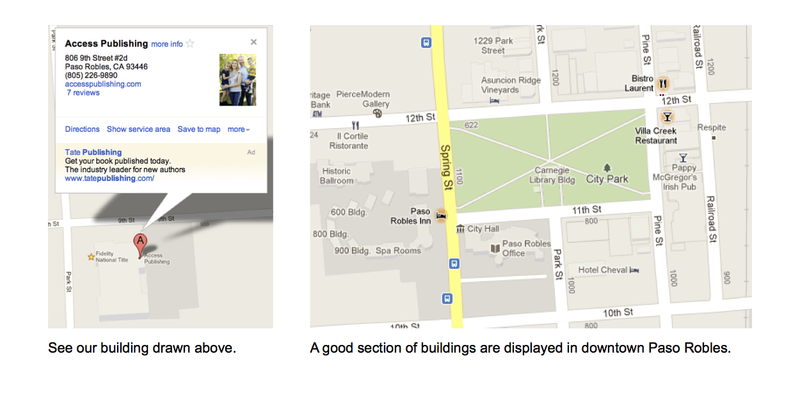 Is your building on Google maps? If your company’s building isn’t on Google maps, it should be. It is easy to check. Go to maps.google.com and enter your address or your business name and town. For our business, I entered “access publishing, paso robles, ca.” Then simply zoom in using the “+” and see what you find. You can see what our map building looks like above. Do you see the dark grey parking lot and the 2D, or two dimensional, detailed outline of our building? It includes a shadow for height that creates an extra dimension that Google calls 2.5D. If you look around downtown Paso Robles, you will notice only a few dozen buildings are created. Most of the blocks are empty. These buildings are not generated automatically. They were created by Google map editors. A Google map editor can add your building and add business related information to your specific location. This geographical data helps customers find you in Google Maps and hundreds of other mapping applications, like GPS units in automobiles. More importantly the geographical data reinforces your Google+ Local page. How do I get my business name to appear? You will notice that names of some local businesses appear on Google maps. The place labels shown are selected by an algorithm based on several factors. You can’t guarantee placement of your business name on the map. Google’s algorithm considers the accuracy of your Google+ Local listing and the richness of the content associated with the listing. You can improve your chances by optimizing your web presence on Google+ Local and across the Internet. A large number of quality business citations will help. Here at Access Publishing we are proud to welcome our newest internet marketing specialist, Jack B. Erhart. He is a Google map editor and expert at helping businesses improve their online presence. He created most of the buildings in downtown Paso Robles and he is now helping our Local Search clients with their buildings. How do I get my building on Google maps? We can help. Access Publishing provides Local Search optimization for dozens of clients throughout San Luis Obispo County. We have an affordable small business plan that we would like to share with you. You can attend one of our upcoming presentations by reserving your seat here: Register. Give us a call at (805) 226-9890.